Look! I’m really in Laos!! 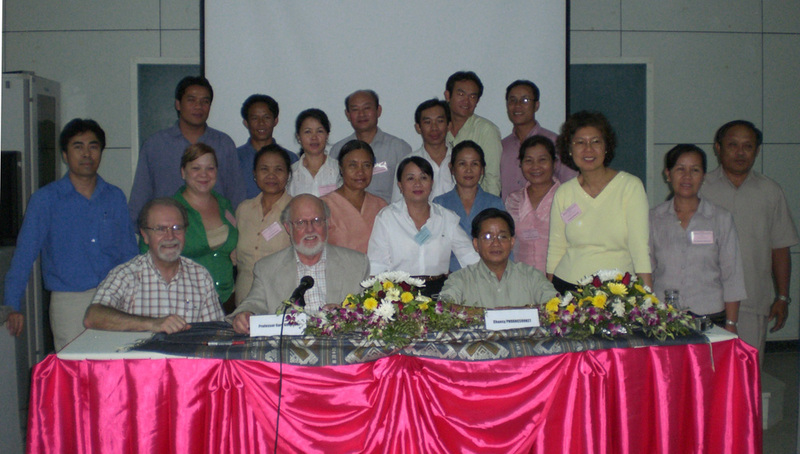 This is a picture of the participants in the IFLA-ALP funded Information Literacy Education workshop at the National University of Laos, including myself (2nd row, 2nd from left), and Drs. Dorner & Gorman (front row, 1st and 2nd from left respectively; my heroes), and Dr. Aree (2nd row, 2nd from right). In the front row on the right is Mr. Chansy, the director of the NUOL Central Library, and my boss. Everyone involved in this workshop has been a pleasure to work with, and I’m really excited to begin my work in the library next week. Tomorrow is the last day, then Drs. Dorner, Gorman & Ahree will leave me all alone in this strange city. I’ve found a lovely place to live in the city centre, I’m moving in on Saturday. The only annoying bit is that it will take me about 1/2 hour to get to the university, which is about 20 km outside of town in a neighborhood called “Dong Dok”. But I am sure I will prefer to live in town, rather than out there, where things would probably get really lonely. I’m not quite sure yet what I will be doing in the library, one of the head ladies there has already aksed me if I can help with some web design, and cataloging french books. What I really want to do is help the university design an information literacy education program for the students, or perhaps help train other faculty on embedding ILE into their curricula, but we’ll see how much free range Mr. Chansy and the other folks give me. One (of the three) librarians at the central library will be leaving in September to finish his MLIS degree in Sweden or Estonia or Latvia or something, so I may take over a large part of his functions while he is away. I’m a bit nervous that I’m in a little over my head here, I worry that the library staff see me as some kine of “foreign expert”, when in reality I’m hoping to learn as much as possible from them. Anyway, we’ll see how things go, and I will, of course, keep everyone abreast of the news outta Vientiane. p.s. I’m sorry if this blog sounds really cheesy, this is an exercise in me trying to maintain a facade of professionalism. Does that mean I’m getting old? I’m just trying to take this gig really seriously. Oh also, IFLA-ALP hooked me up with some cash money to collect data for them, so I want to be sure and do a real good job. But if you want access to the secret blog where I talk about smoking opium and other debauchery, and don’t capitalize anything, contact me for details. It’s pretty amazing getting to watch Drs. Gorman & Dorner work, wow. They are really my heroes. The Lao participants of the workshop seem to be getting these pretty abstract ideas too, which impresses me. I have met a few people who I will be working with in the library, and they are all extremely friendly. Communication will probably be an issue, I hope to learn some Lao as soon as possible. I’ve gotten a few words so far, but I’m excited to sit down with a teacher and really learn. I know I’ve been here for nearly 5 days and I don’t have a single piece of photographic evidence, but I just haven’t had any time. It feels a bit strange to be here in Vientiane, as a foreigner but not a tourist, and yet not even remotely integrated into the Lao culture and basically clueless. I’ve seen a lot of young white folks, and japanese, walking around town, obviously backpackers, as well as some old heads, mostly men, around the neighborhood where my hotel is. They probably live here, ex-pats I’m assuming. I feel a bit isolated, but hopefully soon I will be able to make friends and feel more at home, and less like a stranger. The library director wants me to move into the University guesthouse, which I am not too keen on. Firstly, they are trying to charge me a shitload of money, secondly, it seems quite lonely. I’m afraid to tell him how I feel for fear I will hurt his feelings, but I am meeting some one this evening who will take me to look at some other housing options. oh no! my 8 minutes are up!